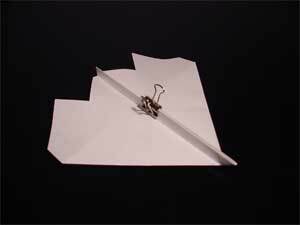 Want to know how I managed to get these paper airplanes to stand up straight for the pictures? 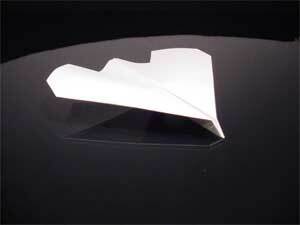 Want something that will hold your best paper airplanes together? 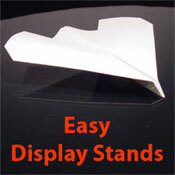 Here is a fast and easy method for making an attractive stand for your airplanes out of simple document clips. 1. 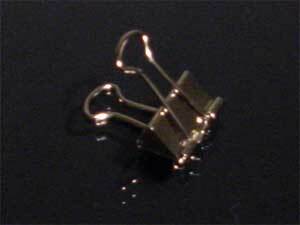 Purchase or find small document clam-clips like the one shown to the left. 2. 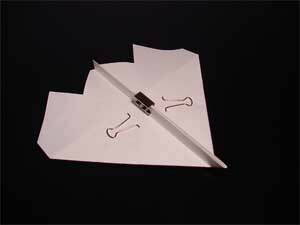 Clip one to the bottom of your paper airplane so the flat rear portion is even with the bottom crease on the plane. 3. Remove the arms by squeezing each one together and pulling from the holes. 4. There you are! Nice, neat, simple, and cheap!